Whether you're a beginner and don’t even know how to begin stimulating your creative juices or an intermediate creative who wants to up his/her game, this episode of Should I Start A Podcast is for you. 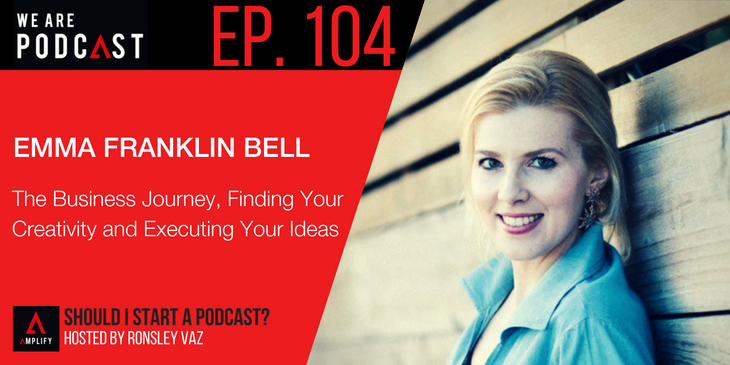 I chat with Emma Franklin Bell, author, entrepreneur, podcaster, artist and former dancer. Emma is the founder of the Beauty Business Academy, cofounder of the Ladies Lounge and her book, “How To Run A Preschool Dance Studio” is one of the leading guides for dance studio owners. Making her the ideal person to turn to for advice on creativity and making a successful business form it. Emma shares with us how to grow your creative abilities over time to activities that help stimulate your creative juices. She gives her insight into the one thing that often holds creatives back from their true potential as well as a healthy discussion on taking your creative ideas and turning them into a business. Ronsley shares his own insights and experiences with creativity, and how he applies them to his own business, Amplify. Why there is no final destination in business, creativity etc.